Chuck Prophet was born in Whittier, California, United States and calls San Francisco home. After recording one E.P. 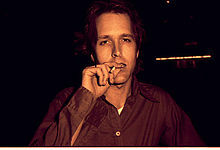 and eight albums with rock group Green on Red, he released his first solo record Brother Aldo on Fire Records in 1990. It was not released in the U.S. until 1997. He has been compared to everyone from Ray Davies, to Leonard Cohen, Tom Petty, Randy Newman and Alex Chilton. Prophet is also a sought-after guitarist known for his unique rhythmic yet lyrical style. He has worked as a sideman or session musician with many artists, including Kelley Stoltz, Bob Neuwirth, Kelly Willis, Aimee Mann, Warren Zevon, Jonathan Richman, Lucinda Williams and Cake. He has collaborated with songwriter Dan Penn and Jim Dickinson. He records and tours with his wife Stephanie Finch, who is a singer, keyboardist and guitarist. Prophet was signed to New West Records by Peter Jesperson in 2002. He made two records for New West: No Other Love and Age of Miracles. After years of mostly European and UK success, 2002’s No Other Love was a breakthrough record for Prophet stateside due to the success of the summer single "Summertime Thing" and endorsements from Lucinda Williams, who gave him the opening slot for her summer tour. Prophet was signed to Yep Roc Records in 2007. Recorded in San Francisco and Nashville, 2007's Soap and Water received critical praise. Prophet toured Europe and North America in support of the album and appeared with his band on the Late Show with David Letterman and Last Call with Carson Daly. In order to better motivate the various musicians and engineers who were involved in the production of this album, Prophet gave them a stake in the master recordings. Prophet has contributed to several Kelly Willis records, and produced 2007's Translated From Love for Rykodisc. Willis and Prophet co-wrote six of the album's tracks and Prophet played guitar throughout. Evangeline Recording Co. released a limited-edition work entitled Dreaming Waylon's Dreams, which he recorded in San Francisco. The record re-creates Waylon Jennings' 1975 country album Dreaming My Dreams in its entirety and features, among others, members of American Music Club and Meat Beat Manifesto. The package and booklet were printed by the legendary Bruce Licher (Savage Republic, Independent Music Project, REM fan club etc.) using a custom letterpress design on original stock. Included in the packaging is a recounting of the events surrounding the recording of the record by close friend John Murry (who also played on the record). Each piece was lovingly printed by hand on a circa 1930's printing press. And each one is numbered. Dreaming Waylon's Dreams is one of the rarest and most sought-after items in Prophet's discography. It is a limited edition of only 1000. Released by Rounder Records, in 2001, Raisins in the Sun was a one-off collaboration with Jules Shear, Harvey Brooks, Paul Q. Kolderie, Jim Dickinson, Sean Slade, and Winston Watson, recorded in May 1999. In 2008 Prophet co-wrote all the songs on Alejandro Escovedo's Real Animal, to which he also contributed guitar and vocals. The LP was recorded in Lexington, Kentucky and produced by noted producer Tony Visconti. In May 2009, Prophet along with a band of musicians including Ernest "Boom" Carter headed to Mexico City to record a collection of "political songs for non political people". ¡Let Freedom Ring! was released on October 27, 2009 on Yep Roc. Michael Hoinski of The Village Voice compared ¡Let Freedom Ring! to Bruce Springsteen's Born in the U.S.A., citing the recordings as "albums that manifest patriotism through disenchantment, and both rely heavily on marginalized characters to expose socioeconomic woes." In January 2011, he formed the Spanish Bombs along with Chris Von Sneidern and San Francisco rhythm section The Park. The Spanish Bombs performed The Clash's LP London Calling in its entirety at the Actual Music Festival in Spain. This special project came at the invitation of curators Houston Party. This festival show was followed by a 12-date tour of Spain. February 7, 2012, was the release date of the Temple Beautiful CD, a "nuanced, insightful and passionate ode to San Francisco" on Yep Roc Records. It was met with positive reviews scoring 82 on Metacritic. The title track Temple Beautiful (featuring Roy Loney of the Flamin' Groovies) was proclaimed "Coolest Song in the World” on Little Stevens Underground Garage. On March 3, 2013, Prophet played a Benefit Concert at The Great American Music Hall for Tom Mallon, a producer who documented much of the San Francisco Punk scene and went on to produce the early American Music Club records. Mallon is struggling with a brain tumor. Members of many seminal San Francisco bands played as well including members of American Music Club, Frightwig, Ugly Stick, Flying Color. On September 23, 2014, Prophet released Night Surfer on Yep Roc Records. The album was met with positive reviews, including a three-and-a-half out of five star rating from All Music Guide. On February 10, 2017, Prophet released Bobby Fuller Died For Your Sins. The album was given four out of five stars from All Music Guide. On February 19, 2017, Chuck appeared on the BBC Sunday morning political show The Andrew Marr Show singing “Bad Year For Rock and Roll," one of the standout tracks from his latest album Bobby Fuller Died For Your Sins. In 1996, Prophet was signed to Funzalo Music BMG Publishing and spent much of 1997 in Nashville as a staff writer. He has gone on to have his compositions and co-writes recorded by many artists including Alejandro Escovedo, Bruce Springsteen, Solomon Burke, Heart, Michael Grimm, Kim Carnes, Peter Wolf, Kim Richey, Carter's Chord, Jace Everett, Arc Angels, Micky & the Motorcars, Bun E. Carlos, Mofro, Calvin Russell, Chris Knight and Kelly Willis. He has toured with Memphis producer and pianist Jim Dickinson, who recorded Prophet's "Hungry Town". In Nashville, Tennessee, Prophet and songwriter Kim Richey penned "I'm Gone", a top-40 country hit in 2002 for singer Cyndi Thomson. The song "No Other Love" was covered by the rock group Heart at the suggestion of Cameron Crowe. It was also featured in an episode of the television series The L Word, and in the film P.S. I Love You. In 2011, it was recorded by Michael Grimm, the winner of America's Got Talent, and included on his Don Was-produced debut CD. Prophet's father appears briefly in the 1955 film Blackboard Jungle. He appears as an actor playing "The Connection" in Revolution Summer, a film directed by Miles Matthew Montalbano and produced by Jonathan Richman. "You Did (Bomp Shooby Doobie Bomp)" was contributed as the theme song to the film Teeth. "You Did" was also featured in the closing credits of the HBO series True Blood episode "Keep This Party Going" (S02E02). The songs "Leave the Window Open" and "Love Won't Keep Us Apart," the latter co-written with klipschutz are featured in the FX program Sons of Anarchy. The "Mission Express" is a bus line that runs through Prophet's neighborhood and is the name of his current band. 1993: Various Artists - Neurotically Yours: A Tribute To The Saints (Still Sane) - track 4, "Just Like Fire Would"
1997: Various Artists - The Inner Flame: A Rainer Ptacek Tribute (Atlantic / Fire) - track 10, "Limit to it"
2000: Various Artists - Frisco Mabel Joy Revisited: a Tribute to Mickey Newbury (Appleseed) - track 8, "You're Not My Same Sweet Baby"
2002: Various Artists - Don't Let The Bastards Get You Down: A Tribute To Kris Kristofferson (Jackpine Social Club) - track 2, "Loving Her Was Easier"
2002: Various Artists - Live at the World Café: Vol. 15 - Handcrafted (World Café) - track 16, "Summertime Thing"
2005: Various Artists- The Joe South Tribute Record (Jackpine Social Club) - track 7, "Don't It Make You Want To Go Home"
2005: Various Artists - Live From The Mountain Music Lounge Volume 11 (KMTT) - track 13, "Pin A Rose On Me"
2009: Various Artists - KFOG Live From The Archives 16 (KFOG) - track 5, "You Did (Bomp Shooby Dooby Bomp)"
^ Sullivan, Denise. "Biography: Chuck Prophet". Allmusic. Retrieved 3 May 2010. ^ Berger, Sam (31 December 1997). "Chuck Prophet - Brother Aldo". No Depression. Retrieved 25 April 2017. ^ Allen, Jim. "Album review: Chuck Prophet – '¡Let Freedom Ring!' (Yep Roc)". LimeWire. Archived from the original on November 1, 2009. Retrieved 28 June 2010. ^ Kamin, Jeff. "Age of Miracles Review". Artistdirect. Retrieved 28 June 2010. ^ Wilson, Steve. "Chuck Prophet – Let Freedom Ring". KC Free Press. Retrieved 28 June 2010. ^ a b McLeese, Don. "Sonicboomers - ALBUM OF THE WEEK". Sonic Boomers. Retrieved 28 June 2010. ^ "Top Ten Guitarists (That Don't Often Make Top Ten Guitarists Lists)". Neon Filler. Retrieved 25 April 2017. ^ Murry, John. "Chuck Prophet Biography". WXPN. Retrieved 28 June 2010. ^ Mehr, Bob (9 October 2006). "It Takes Two". Seattle Weekly. Retrieved 25 April 2017. ^ Murry, John. "Biography". Retrieved 17 July 2010. ^ "Press : Soap And Water". Chuck Prophet. 2008-11-12. Retrieved 2014-03-25. ^ Hoinski, Michael. "On the Haunting Songs of Chuck Prophet". The Village Voice. Retrieved 17 July 2010. ^ Vaziri, Aidin (17 January 2011). "Chuck Prophet doing 'London Calling'". SFGate, San Francisco Chronicle. Retrieved 16 January 2011. ^ "Soap And Water". Retrieved 17 July 2010. ^ Bezezekoff, Leigh. "Live in San Francisco, Day 3: Chuck Prophet". KEXP. Retrieved 29 June 2010. ^ "選んで家具ソファー！". Revolutionsummerfilm.com. Retrieved 2013-06-04. ^ a b Rogers, Jessie. "The Very Best Noise: Chuck Prophet Checks In". Tea Party Boston. Retrieved 17 July 2010.